If she had dropped the her attempt to shunt her excellent writing on the plant kingdom into a bad attempt to justify a philosophical agenda under the veneer of her scientific credibility. Worse! Readers lacking an advanced skeptical toolkit and experience with these topics will be unable to disentangle Goodall's messy blend of real and junk science in the later chapters. Goodall, a primatologist, betrayed a vast ignorance of other fields of science, even going so far as to reprint long dead controversies as if they were never resolved. If this book sells well, it could set back this debate by a decade or more. Not as a narrator, I've seen talks by Goodall. Her voice is so soothing I feel like I'm criticizing my grandmother. I understand Goodall has a philosophy that sees the act of breeding/engineering new kinds of plants as a kind of violation of nature, and is intrinsically untrustworthy. I also understand this as a kind of moral intuition, one that she attempts to justify the best way she knows how, the authority of science. I can respect that in the same way I respect a man who only eats kosher. I can appreciate his moral intuition, even how he satisfies it, without agreeing with his justification (ie, pork being bad for you). Goodall makes a complex subject relatable. Absolutely would recommend. I now have a much broader understanding of the world of plants and their importance to our environment. Goodall makes us understand in very clear and precise terms why protecting our plants is so important to our planet's well being. What other book might you compare Seeds of Hope to and why? I would compare this in quality and information to her other wonderful books. It provides an informative and cautionary tale not unlike Stephen Hawking's books. But on some level - more relatable. Which character – as performed by Edita Brychta – was your favorite? I was particularly moved by travesties perpetrated on the planet by the large chemical companies Dow and Monsanto. Miss Brychta expressed true outrage and heartfelt disdain, as written by Miss Goodall, for the misdeeds of these chemical giants and the consequences of their actions. The greed without remorse is startling. I thought Miss Brychta's narration was excellent and made for easy and enjoyable listening. Miss Goodall continues to make very complex subject matters very accessible. An amazing book, full of great information and both hopeful and scary news. 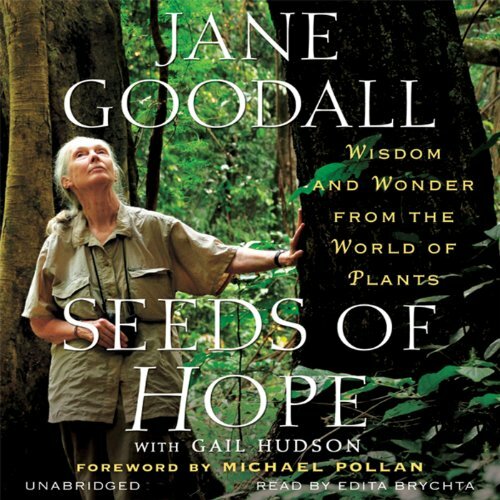 Some of the descriptions of gardens and such are a bit long, but that's to expect with Jane Goodall's enthusiasm and love for the plants and animals of this world. Strongly recommended for anyone who cares about our planet--especially the plants. Jane Goodall is an amazing person. She personifies the calm curiosity in which we should all approach the world. Her life choices and experience are inspiring, her story is touching and reading this book definitely planted a seed of hope in my soul.